The first day of October has dawned and with it the introduction of the LVR restrictions imposed by The Reserve Bank on the main trading banks forcing them to reign in their lending to borrowers with low deposits (less than 20%). Certainly this is going to have an impact on the property market. It will impact those who either do not have the necessary 20%+ deposit and also importantly those who do not want to tie up that much capital in a property, especially an investment property. Investors tend to like to highly gear their investment properties so as to maximize their interest cost recovery against tax. Therefore there will likely be an impact not only among first-time buyers but also investors. However as with all matters economic, there is always a contrary position and in fact there will be winners or potential winners from the LVR restrictions. The fact is the main trading banks whilst strictly adhering to the new policy (especially as their operating license is at stake, not something they are likely to risk for one second) will not for a moment relinquish their desire to continue to build their business by lending against property as a secure asset. These banks are hardly going to be able to settle back and report to their shareholders that they have seen their profits fall because of this policy. Their shareholders will rightly expect them to seek to find alternative lending options to make up for any potential loss of clients in the high LVR market. This is where that contrary position comes in. If you are not a first-time buyer or an investor. If you have a healthy equity ownership in your property and you are possibly looking to buy a house or refinance. You may well now find out that your local bank is even more happy to see you, greet you warmly and encourage you to discuss options with you. The fact is that for every large value low-LVR mortgage that a bank can write, will effectively allow them to offer a lifeline to first-time buyers and investors. Here is a somewhat simplistic example to illustrate this situation. Lets say a bank as of last week has 25 prospective mortgage customers. 10 of those customers are after a 90% mortgage to buy a property and they all want to borrow $300,000 to fund that purchase of a $333,000 property. The other 15 customers happen to be customers with a larger portion of equity. They are looking to borrow $750,000 each to buy a $1.25m home – 60% LVR mortgage. This package of mortgages totals $14.25 million and results in the bank having 21% of its mortgage book in loans over 80%. A situation that the Reserve Bank says has to stop from the 1st October. So from the 1st October the bank in the same scenario of those 25 new customers would have to turn away 6 of the 10 customer who wanted 90% mortgages to ensure that their total mortgage book has no more than 10% in high LVR mortgages. This decision would cost the bank a 13% fall in overall lending, down to $12.45 million and likely a consequential fall in profits. 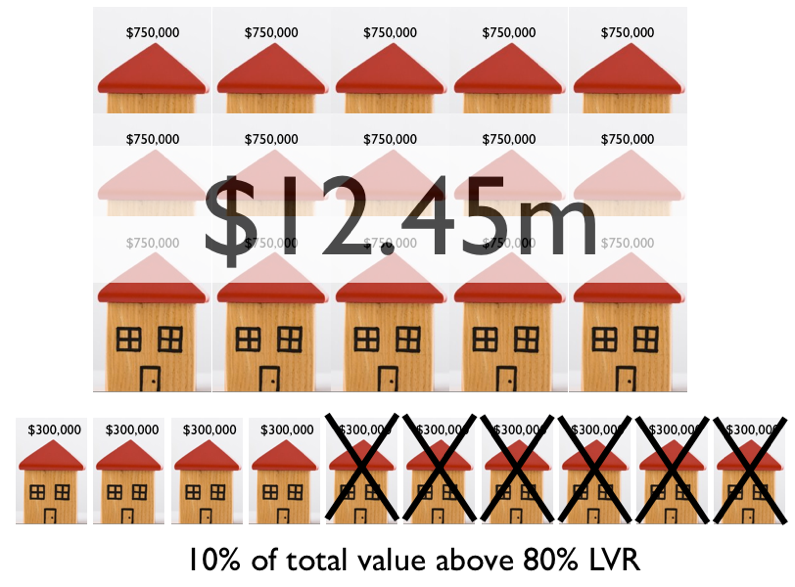 However if the bank reached out to some more of these higher value customers who are well below the 80% LVR threshold and offered them an enticement in the form of lower interest rate or other inducement then by attracting just 2 more of these higher value customers they could also satisfy one more first home buyer and in so doing end up with 22 customers rather than 19. They would have a total mortgage book up 5% at $15 million and a potential competitive advantage. So my advice is be alert to some very friendly and generous bank representative courting you if you are after large mortgages and if you have a good strong equity position in your home! The headline may be a case of deliberately stating the obvious, after all, economists will always tell you that investments of any shape or form; whether shares or property perform well in the long term, their advice is be patient, stick with it. No; my interest was not in a catchy headline. I wanted to examine the data behind the claim that longer term investing in property from a rental business perspective is less volatile, especially when compared to shorter term investing. To be clear I judge short term to be 3 to 5 years with long term being 10 years. The ability to undertake a detailed analysis of the investment returns of rental property has been greatly assisted by the Ministry of Business, Innovation and Employment who have released online the full data set of rents by Territorial Local Authority (TLA) by month going back to 1993. The data set identifies the mean rents and the lower quartile rents. I have used this data set and mashed it together with the REINZ median house price data going back to 1992 and the Reserve Bank of New Zealand data on mortgage interest rates for the same period. This collection of data has allowed me to build a model that shows the real rate of return based on the median house purchased and rented with a notional 100% mortgage paying the monthly variable rate of interest on the mortgage. The rate of return is based on the selling price at the end of an investment period being the median price at that month, plus the monthly rental income, less the mortgage payments, less the original purchase price at the start of the investment period based on the median price at that month. Note that mortgage payments are only the interest component. Before detailing the presentation of this data I thought a couple of preliminary charts might be of interest. The first is the indexed growth of property prices and rents over the period since 1993. Not surprising here. Property prices have soared ahead of rents. Given the often quoted economists view that property prices need to reflect fundamentals of the comparable cost of renting, the message clearly have not got through. The massive divergence of the indicies from 2003 onwards is so clearly seen in the chart. There was some adjustment as property prices eased back in 2008 but the recent resurgent property market now sees property prices at an index of 350% of where they were in 1993 with rents at 232%. Looking at the financial performance of rental investment, a simple judgement of the investment is to see how much of the monthly mortgage repayments is covered by monthly rents. The chart below details this as a trend line by month from 1993 to date. As can be seen the fact is that at only two occasions over the past 20 years has the the mean rent actually come close to covered the monthly mortgage. Towards the end of the 90's when property prices stagnated and interest rates fell as a function of the Asian Crisis and then again in 2002 jus before the massive surge in property prices again at a time of low interest rates. However in today's world when interest rates have never been lower for longer the rental income barely covers 80% of the mortgage repayments as property prices continue to grow. 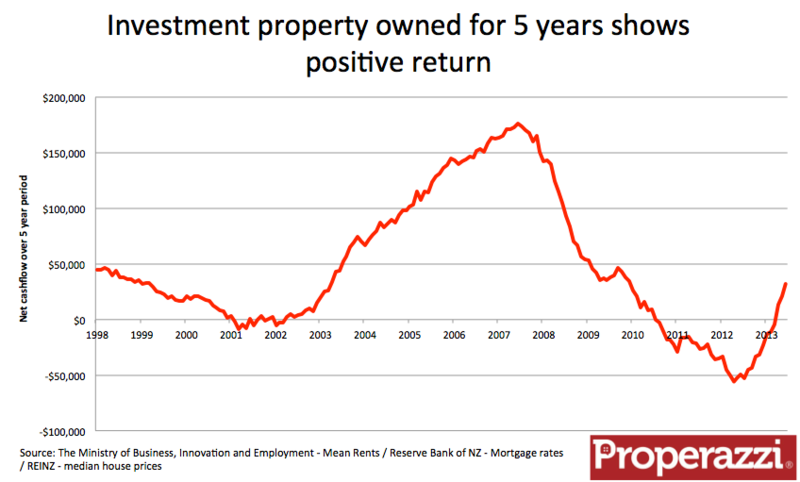 So having provided some contextual data for the mean rents, property prices and mortgage rates here are the charts which show the actual financial return in dollar terms for rental property invested over a 3 year / 5 year / 10 year period for each month right up to June 2013. Over the 3 year horizon the significant returns achieved by buying in the early 2000's are not even close to being achieved again at this time and clearly the worst outcome would have come from the net losses attained in the period of 2009 to 2011. The 5 year horizon resembles very much the 3 year investing picture, with slightly higher returns for those exiting in the perfect position of the peak of the market in 2007 - again recent returns based on a 5 year investment come nowhere close to those levels. The 10 year investment horizon demonstrates the value of long term investment which is always around $70,000 for the 10 year period. What is interesting is despite the recent low interest rates and rising prices the recent level of return is declining and is likely to continue to show lower returns on a 10 year horizon as the purchase period slips into that period that saw the greatest rise in property prices. So the guidance would be - hang on in their for the long term. The short term investment of 3 or 5 years can achieve excellent returns but as ever you have to time the market perfectly and this is only ever really seen in hindsight. The current return on all 3 periods shows a level lower than the peak and the average.